Rosemary Mariner, who became the Navy's first woman to fly a tactical fighter jet in 1974, died last week at age 65 of ovarian cancer. The rules were clear when she was growing up: Women were not allowed to fly U.S. military aircraft. But that was not going to stop Rosemary Bryant Mariner. The daughter of a Navy nurse and an Air Force pilot who had died in a plane crash when she was 3, Mariner made it her goal to be as qualified as possible to fly in the armed services. She got her private pilot's license at 17. Then she got her aeronautics degree from Purdue University in 1972 when she was 19. A year later, as a growing feminist movement took hold amid a push for the Equal Rights Amendment, the Navy lifted its restrictions and opened up its flight program to women — setting Mariner on a path to becoming a pioneer in the military. She was in the inaugural class of women who earned their Navy wings in 1973. 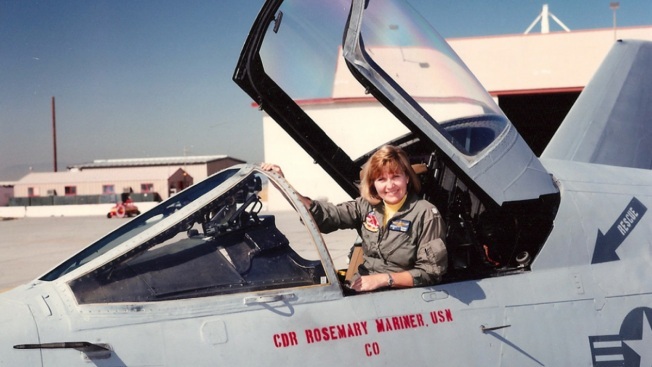 Mariner then became the first woman to fly a tactical fighter jet in 1974, at just 21; in 1982, she was among the first women to serve aboard a U.S. Navy warship; in 1991, during the Gulf War, she became the first woman to command an aviation squadron. Later, she was instrumental in the repeal of combat exclusion restrictions on women. Capt. Mariner died at 65 last Thursday, Jan. 24, of ovarian cancer, nearly five years after she had been diagnosed. At her funeral service on Saturday, the Navy plans to honor her with a "missing man flyover" — a tribute honoring aviators who have died — that will consist of all women. It will be the first all-female flyover ever, the Navy said.